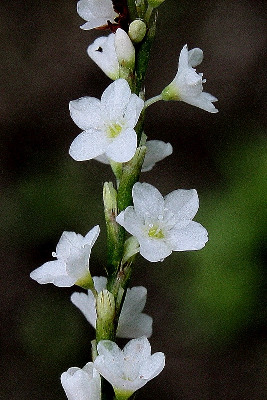 Polygonum punctatum of Michigan Flora. Marshes, edges of lakes and rivers, shores, and mucky hollows, often in very wet places (even cold spring-fed areas) and seems frequently to grow in somewhat more shaded places than other smartweeds. The inflorescences tend to be straight, while in P. hydropiper they tend to nod. MICHIGAN FLORA ONLINE. A. A. Reznicek, E. G. Voss, & B. S. Walters. February 2011. University of Michigan. Web. April 22, 2019. https://michiganflora.net/species.aspx?id=2289.